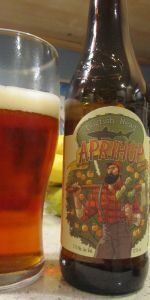 Aprihop is an American IPA brewed with Pilsner and Crystal malts. It's massively hopped -- in the continuous fashion, of course! -- and the flavor is complemented by the addition of apricots. After fermentation, the beer is dry hopped with irresponsible amounts of Amarillo hops. The beer has a hoppy aroma, with the apricots playing a supporting role. The flavor is rich with late hop flavors, and its bitterness is tempered by just the right amount of malt sweetness and fruity undertones from the apricots. Had this last night at Bukowski's. Very intersting stuff. Kind of like Magic Hat # 9, but doubled and with much more hops. It had a huge apricot and hop nose, very light & creamy on the palate, very falvourful and very drinkable. An IPA that meets a fruit beer. Hmm? I like it.
? Huh? This is an experimental beer regardless of what the brewery says. An IPA with fruit added is experimental, flowing smoothness and almost reminiscent of some new Belgian upstarts that throw fruit and excessive hops into a delicate brew. Madness that I like. Poured out nice into a tall glass with good color. Little foam head that didn't stay long. Smell was good but didn't taste at all like it smelled. I bought this on recommendations but I'm sorry to say. Didn't like this beer couldn't even finish it. I will pass on it if I see it agin. Not alot of head. Dissipated almost immediately. It just, sort of, beaded up in the middle. Light ruby color. The head is white. Go figure, red beer and white head. There was minimal carbonation. Just a small stream coming from the bottom. Although, as the beer warms up, the carbonation does become more pronounced. It wasn't really what I was expecting. I don't smell any apricot. The aroma was very similar to the 60 minute IPA. Light malt, light hop, just light everything. The crystal malts were probably the most prominent aroma. I was pleasantly surprised because there was no apricot/peachy flavors to speak of. Only an astringent peachy aftertaste. The Hops and Malt are definitely the prominent taste in this beer. The apricot definitely doesn't do anything for this beer. It's almost as if it was an unwanted accident. And DFH said, let's just go ahead and bottle this beer anyway. It's very astringent, it's not very hoppy. I can drink it without cringing (I guess). This is just... It's not that good. Definitely not as good as what they are charging for it. I would give this a 'C'. I'm never gonna buy this again. I'm never gonna look for this. I'm gonna get through this glass but... It's nothing special. I'm definitely not going to waste my money buying another one of these. I don't really care for the astringent aftertaste that the apricots provide. The plus is that it's NOT a fruit beer, as the name would suggest. But on the down side, It's certainly NOT an IPA either. I've had weak American Ales with more hop presence than this. The hops are VERY subdued. The DFH websites describes it as being... "continuously hopped with irresponsible amounts of amarillo hops." Irresponsible? I don't think so. Maybe in the brewery, but it doesn't come through in the smell or taste. So based on all of that, is it worth the money? $9.99 per 1/2gal growler. == .16 cents per oz. I don't believe in 4 packs. Especially not for a beer with such low quality (compared to the style it is classified under). If this were about $9 for a 6 pack, I can see myself paying that for this particular beer. But it's not worth more than that. And I am stretching here to find some positive aspects. Most people like this beer. I don't know why. But you make your own decision. Maybe this beer's for you and maybe it isn't. A - Pours a clear amber, copper color with an inch off-white head that sticks around as a small cap. Lacing is pretty awesome. S - Smells abundant, like apricot jam and dark sweet toasted bread. Then a nice citrus hops and apricot finish. T - Firm yet flowery, much better than #9 Magic Hat to which it's compared. Follows smell, flavor is abundant and well balanced. Starts as a crisp citrus hop taste up front and a rich, jammed and long apricot finish. M - Beer has great wesight and is fresh and crisp. O - Must try. Well executed. Apricots? Sure! IPA? Sure! Together? Hell no. I really wanted to like this. Apricots are one of my favorite fruits, and IPAs make me happy. Why cant this bee good? It lacks any of the nuanced silkyness that an apricot has, and simply assaults your mouth with a silly sweetness, a dimensionless bitter, and a dirty after taste. Dogfish head, this is very borderline. Pours a nice pale orange color with a fine slightly off-white head. Lacing is very nice on this brew. Aromas are hops, apricot (which is a fine addition in my opinion), and a malty sweetness. Flavor is outstanding. While this is not really the best example of an IPA, I would have to say that, as far as experimentation goes, this is such a great combination of flavors, I don't really care, I just call it "good." Very dry overall, while there is a lot of sweetness to this brew, it is very well balanced with the hop bitterness that is also very prevalent. I found this one at my local bottle store and was a little skeptical at first. Nevertheless, I bit the bullet, and tried it. I was not disappointed in any way. This is a fine brew and will stock it as part of my regular selection in my fridge (for as long as I can find it anyways). Mouthfeel equally unimpressive. Alcohol somewhat present, a thin and watery makeup. Hops resonates on the finish. The apricot can be hard to detect on some sips and again, a strong off-putting malt is too aggressive in the forefront. Overall, quite spotty. I expected a little better.